Given the current inundated state of the Mississippi, our attention has been unavoidably drawn there. In perusing the coverage of the flood, thoughts keep coalescing around the post-facto coding of rivers induced by those events, meaning how river infrastructure (intended to harvest or manage the system) emerges as physical manifestations of the laws and acts passed in response to those floods. In the U.S. and elsewhere, watery rivers are constituted by temporal streams of officiated words and the programs they set in motion. 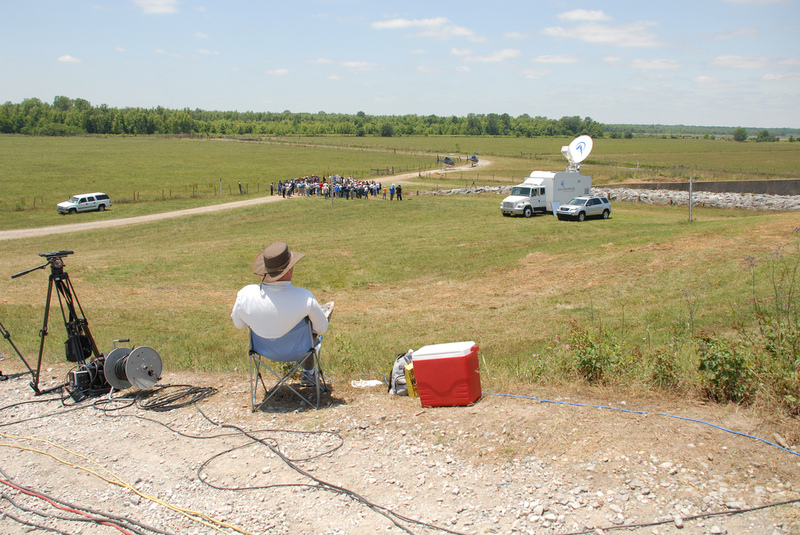 The construction that has become the Mississippi River is what it is due to transformative geo-climatological events and the cultural responses they trigger. The really big flood events shake up the field, and between those events are these relatively long periods of incremental accumulations of colonizing stuff that’s adapting to the new field of conditions. Each turn of this cycle seems to alter the river a bit more from what it was before. As Jane Wolff recently put it (in reference to New Orleans), these are stealth ecologies that are formed by a prolonged layering of” reciprocal interactions between natural processes and cultural constructions”. These ecologies are stealthy in that their incremental construction of something vastly different from what was originally there typically goes unseen for the hybridized and novel systems they have co-evolved to be. Until, of course, the next big flood or some other massive event comes along that reveals them for what they are: uniquely chosen, constructed, and living trajectories. We could say that a flood is not only simultaneously destructive and regenerative of a river landscape, but equally transformative of the laws, policies and the physical infrastructure that attempt to manage it. It’s in and around these remarkable short events that the monumental shifts – physical and cultural – tend to happen; that moment of punctuated equilibrium when the landscape (as broadly conceived) is reformatted by chaotic and creative events manifested in water, sediment, homemade levees, abundant and divergent media narratives, and emergent policies for a freshly observed future. Thus our interest in the floods of 1927, and its connection to what’s happening now. 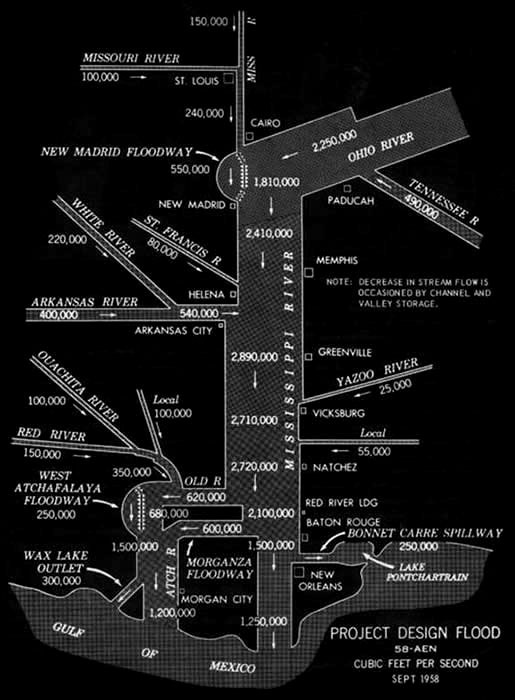 The strategies generated by the The floods of 1927 seem to have been pretty close to a paradigm shift for the Army Corps of Engineers’ then current river control strategies. 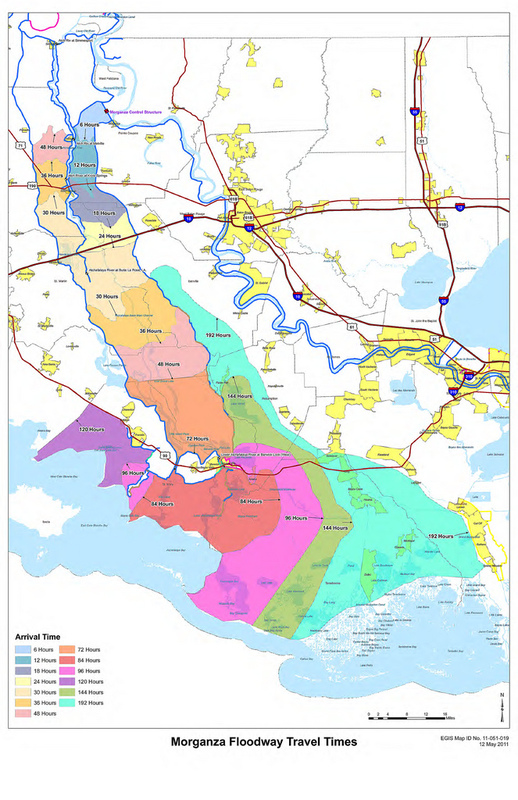 There was a hard realization that all those miles of levees that worked at a regional scale were impossibly small play things when it came to dealing with above average stormwater drainage funneled from 41% of the land surface of the nation (a definition of an event landscape). 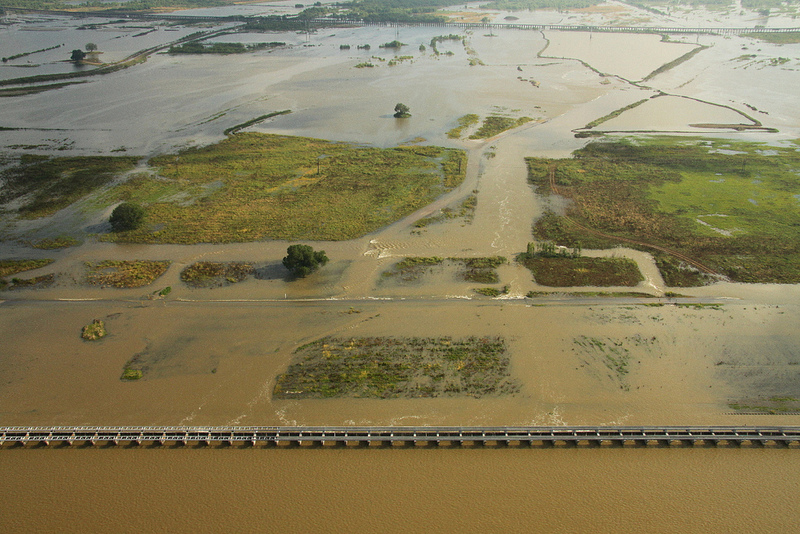 Rather than just making the levees taller and thicker (which they did), they also made some well-observed retractive moves by actually giving way to the river at some of their weakest levees points through the creation of the floodways (the Bonnet Carre Spillway is located where a levee had failed multiple times). By expanding the infrastructure and creating release valves, the river was still under control, but only by giving it back its floodplains when its asks for them. Like floods themselves, the floodways are stealthy features in the landscape. Covered in crops and green leafy things much of the time, their systemic function and appropriation slips to the background in the calm between the big events. When the floods return, the Army Corps is forced to dust off their presentation boards and attend the requisite media circus to reviewthe instrumental theory designed and codified over 50 years ago, which produced a diagram with such persistent instrumental effect that Deluzians should appreciate. It’s this enmeshed choreography of flux and time that we find so telling in the “management” of Rivers; trying to trace timelines and their attendant feedback loops that have been building off one another since the “The military engineers of the Commission [took it] upon their shoulders the job of making the Mississippi over again — a job transcended in size by only the original job of creating it.” (Mark Twain, Life on the Mississippi, 1874). Which codes and physical infrastructure persist and which acts become ossified and ineffective relics? 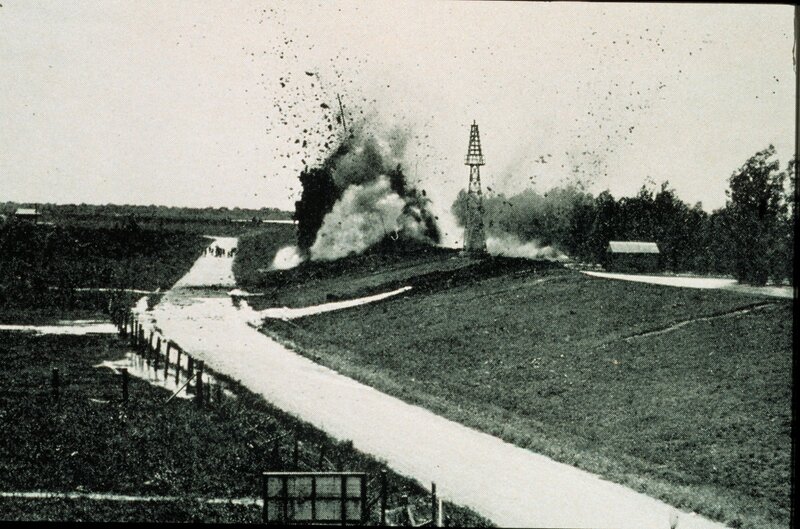 As was seen in 1927, new potentials are latent in the aftermath of an altered landscape. 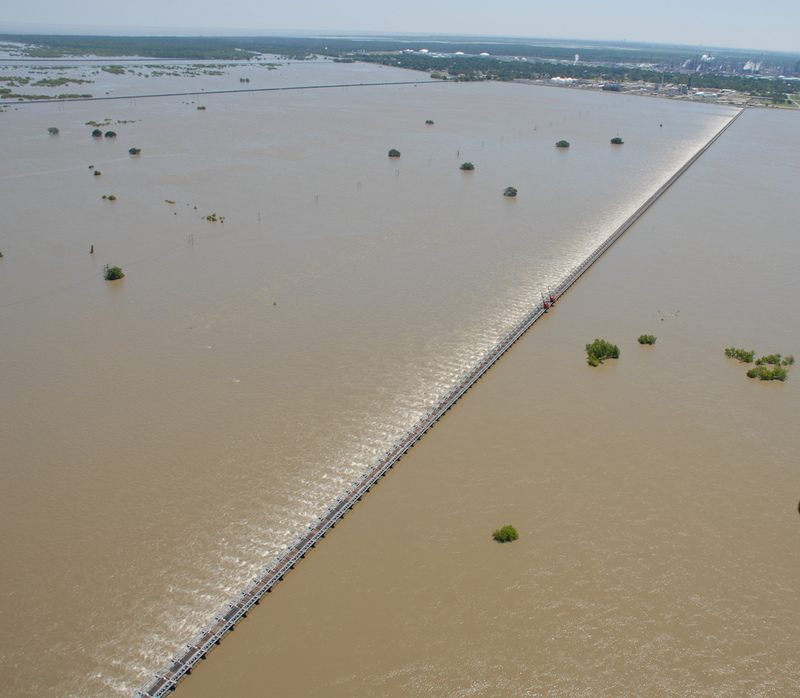 When the current flood waters subside, what might be made different? What worked and what didn’t? Will the same interim cycle be performed again? Either trajectory will offer a course we will learn from. Interesting time to read, or reread Mississippi Floods. And if you haven’t noticed yet, Mammoth is currently inundating the blogosphere with a timely deluge of geographically dispersed postings on the topic of floods.